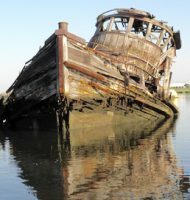 Much more catching up to do, but first, I share some New Orleans photos from last week and then related photos and response from my inbox to the review of Tugboats Illustrated here. This first series I include because I’m amazed by this maneuver, but it does not effectively depict it because a) I was moving behind and then alongside and forward of it in the series of photos taken over a 30-minute period of time, and b) I would need to get the photos from a fixed aerial position as it made the turn, and c) this is a relatively small tow . 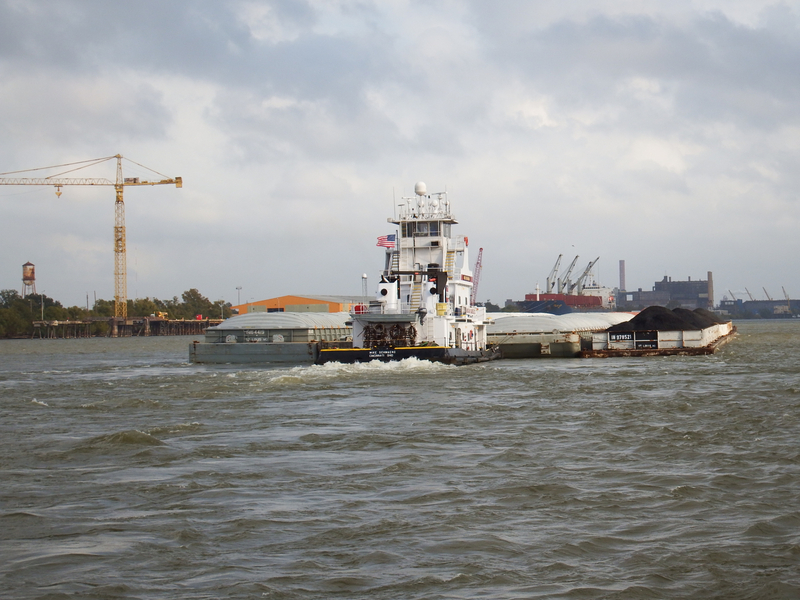 . . only 12 barges in relatively calm conditions. Starting at 4:23 pm last Tuesday, I was following Ingram Barge Co. Mike Schmaeng. Many years ago now I did this post on Ingram. 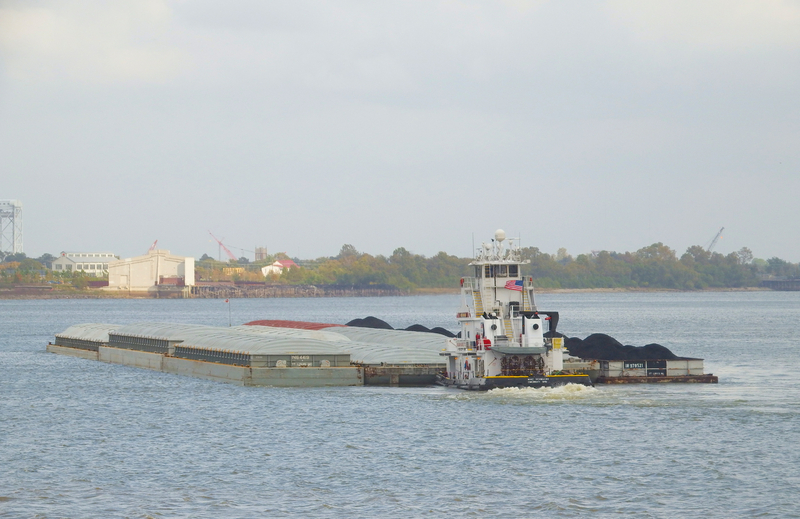 Ingram is a company that operates 150 boats, 5000 barges, over 4500 miles of inland waterway . . . all approximate numbers. On my next trip to Nola, I’ll set up on a tripod at a fixed point, maybe the upstream end of Crescent Park. I also intend to check out some tighter points, such as Wilkerson Point, shown below. So now, in response to this photo from my review of Tugboats Illustrated . . .
“RE: Sketch from the tugboat book. The sketch showing a tow in a flanking maneuver is not how we do it on the inland rivers. 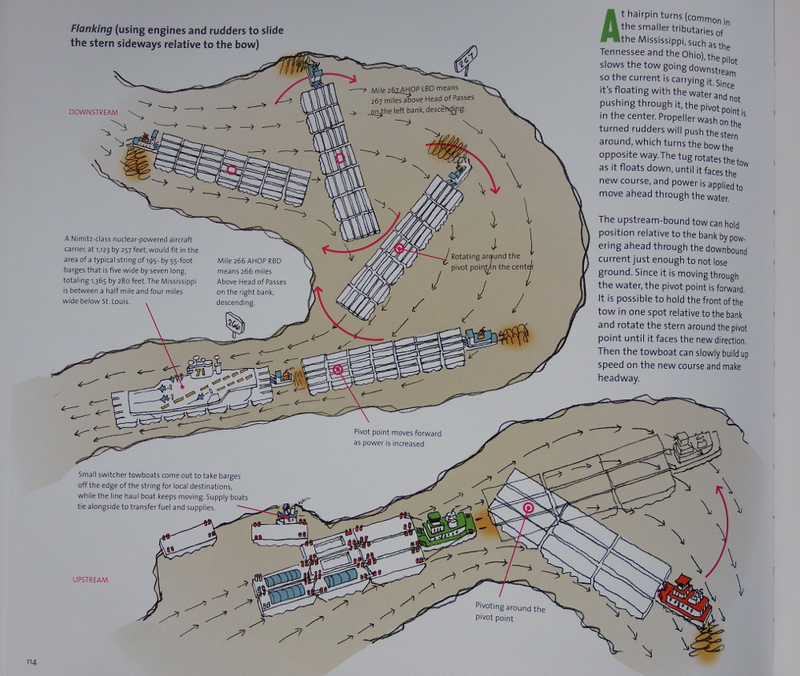 If a tow is flanked as shown in the sketch, it will ALWAYS end up against the bank below the bend. 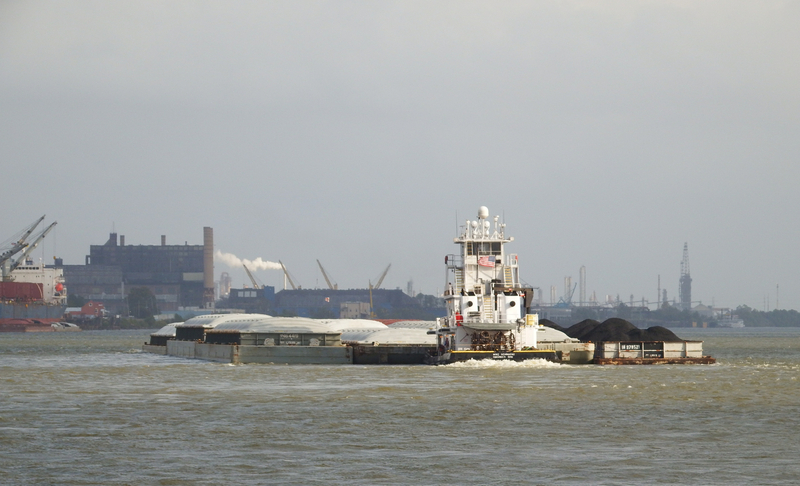 Attached is a photo of a towboat flanking Wilkerson Point, just above Baton Rouge. You can see from the wheel wash that the pilot is backing full astern to get the stern of the tow near the inside of the bend. He is not quite in position yet, but the tow will take up nearly the entire river. The stern of the boat will only be a hundred or so feet off the point all the way around the bend. A pilot will call on the radio, stating his intention to flank such and such a bend, point or bridge. 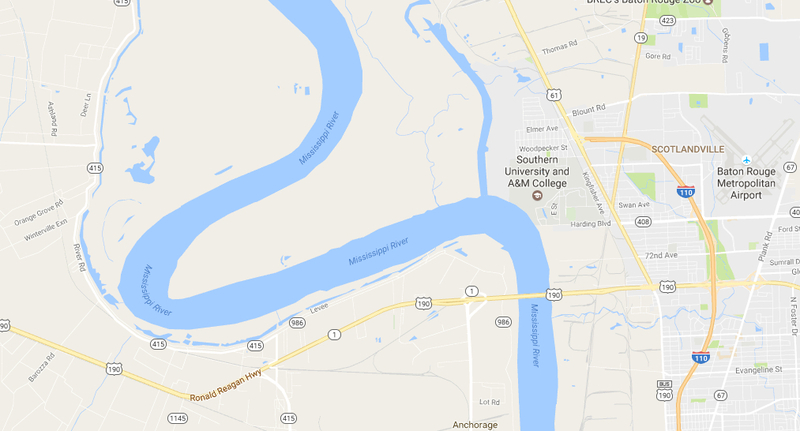 Because for all purposes, the channel will be blocked, ALL northbound traffic, including ships will be required to stop well below the bend. From the time the pilot stops his engines to get into the flanking position until he can come full ahead coming out of the bend, it may take 30 to 45 minutes. The tow will probably not be in a position to come full ahead again until it is in the area of the refinery at top right. 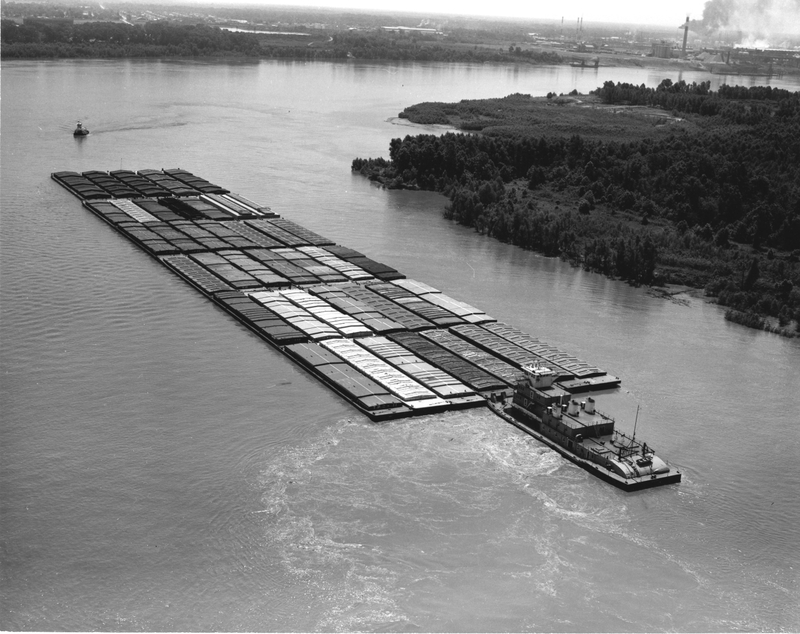 All “heavy” tows like this will flank certain bends and bridges between St. Louis and New Orleans at certain stages of the river. 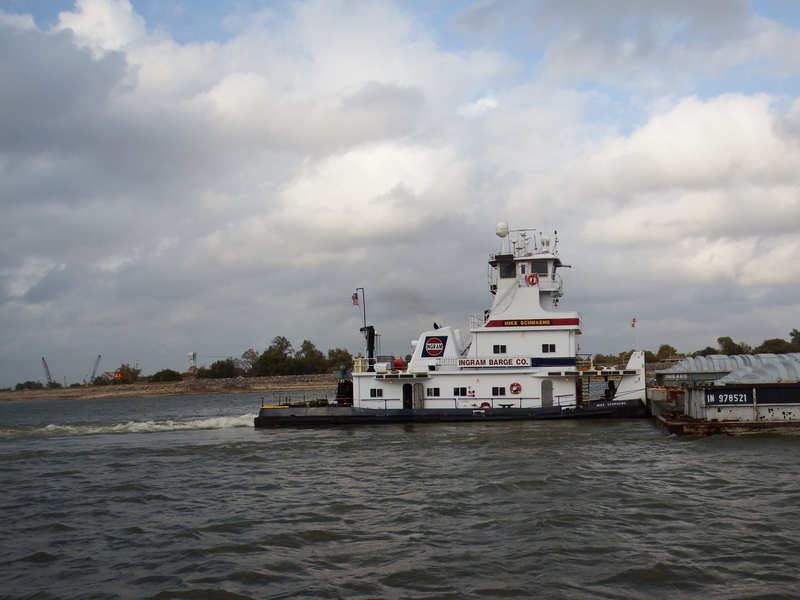 Before departing St. Louis, a downbound tow will place “flanking” buoys at each outboard stern barge. The buoys are marked on the second photo [with letter Os]. Since the current is used to float the tow around the bend, the inner buoy will show the pilot when there is no sternway or headway in the current and it is this buoy which tells the pilot that the flank is being correctly done. A flanking buoy is in place on the other corner because there are both left and right hand flanks required. 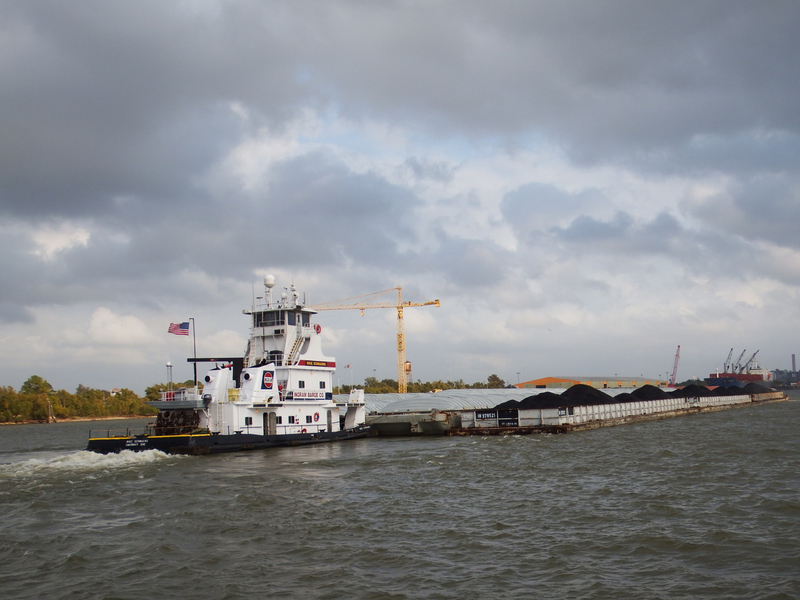 A tow of 35 loaded barges is common on the Mississippi River. A downbound tow will be made up seven wide and five long, not as stated in the book. A pilot has better control of such a tow during a flank. A northbound tow will be made up seven long and five wide, to get it through the current better. 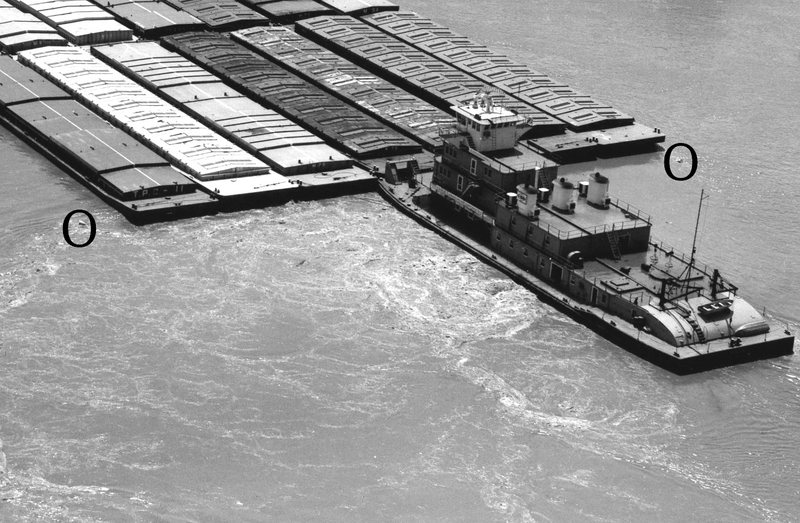 The boat pictured in the photo is the AUSTEN S. CARGILL (now Justin Paul Eckstein), owned by Cargo Carriers, Inc., Minneapolis, a Cargill subsidiary. It is 182 by 55 feet. It is triple screw and at the time of the photo had a total of 6,630 hp. This photo was taken in 1964. 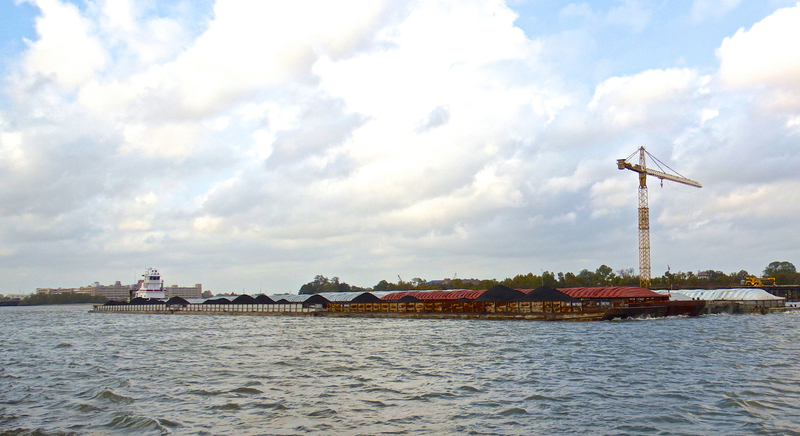 It had 57,908 tons of grain in 40 barges, according to Cargill. A tow being flanked may need just a gentle touch on the head of the tow; that is why the tug is approaching the head of the tow, to assist if needed. Thank you, sir. And I hadn’t known about flanking buoys. 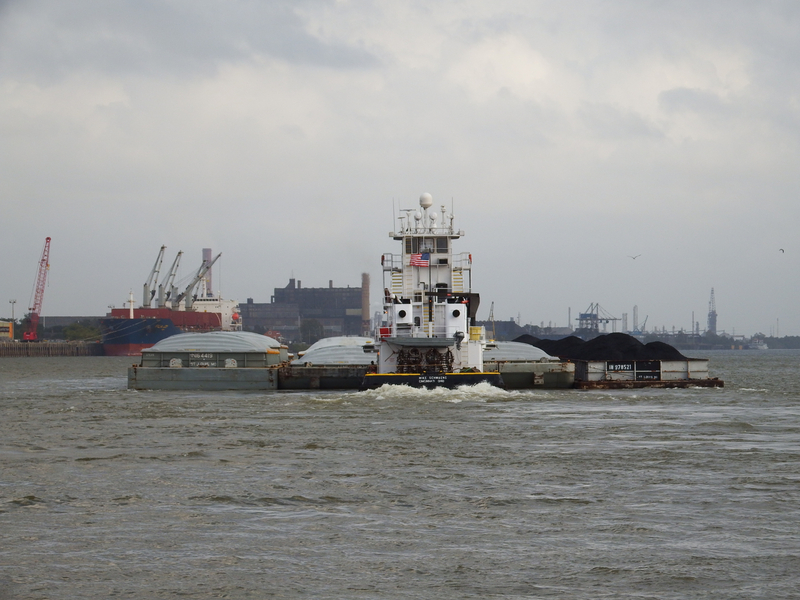 Click here for a 5-minute video by Towboat Toby who gives a really clear explanation as he walks a tow downstream around Wilkerson’s Point in high water. Towboat Toby, I’m your fan! So, what think you, readers . . . and I don’t mean to backpedal on Paul Farrell’s excellent book, could that particular drawing have been modified to improve verisimilitude? I like the looseness of Mr. Farrell’s drawings for the most part, but I think the Mate makes a good point. And just calm talk . .. not punches, please. The writer makes a reasoned and constructive comment.